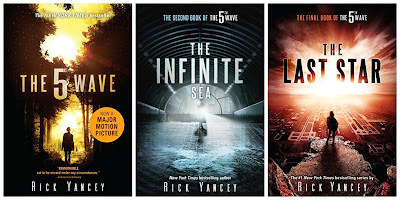 If you've been following along with our What the Wenches are Reading posts, you'll know that I recently listened to The 5th Wave trilogy by Rick Yancey. I will admit, I saw the preview for the movie in front of.....something, I can't even remember which movie I was there to see, and I was intrigued. Then, my dad said he had read the first one and enjoyed it. That's all the recommendation I need, so I figured I would give them a try. I was not disappointed. It's not the greatest trilogy or series I've ever read, but it was quite enjoyable. It was also a little different from the others I've read. Join me after the break to read some spoiler free (or at least spoiler light) thoughts on this series. First, a little background. As I said above, this series is a trilogy. 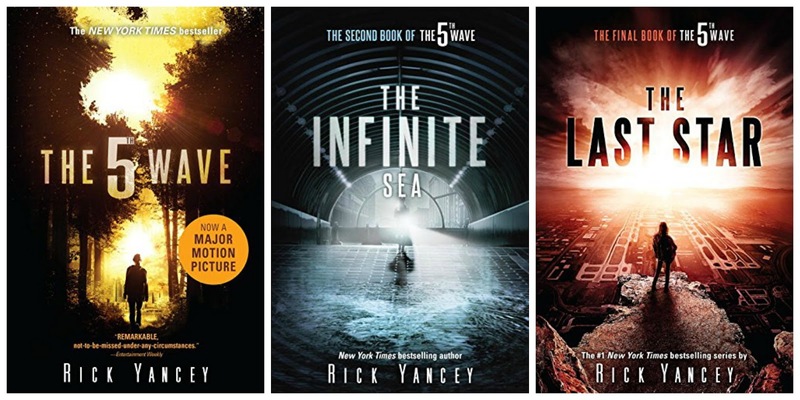 The three books are The 5th Wave, The Infinite Sea, and The Last Star. It's a young adult series told from the point of view of four teenagers and one five year old boy. The story takes place shortly after the start of an alien invasion. Cassie Sullivan is separated from her brother and will do whatever it takes to keep her promise to find him. She'll do whatever it takes to keep him safe. The series follows her through finding her brother and their fight for survival during the alien takeover. The reasons for my enjoyment of this series are varied, but the number one reason is its protagonist, Cassiopea Sullivan. Cassie is a caring, loyal, determined, snarky, sarcastic, and average looking, by her own admission, 16 year old girl. She is not your typical ingenue. That is why I love her. She reminds me of Katniss Everdeen from The Hunger Games series. But, she doesn't have quite the level of Katniss' emotional baggage and detachment issues. Cassie has no problem admitting her feelings for someone. Though, she often prefaces it by saying that she has no idea why she feels this way because of something the person has said or done, usually with an insult or two thrown in. She is also smart, both book and street, which comes in handy in this series. One of the things I noticed about Cassie is that she has a great voice, thanks to author Rick Yancey. I was shocked at how well he captured the voice of a teenage girl. Maybe he grew up with sisters or has teenage girls of his own, I don't know. But, he did a great job capturing the teenage voice. She speaks just like I did when I was that age. Her emotional reactions all feel real and exactly what I would have done in that situation. She is probably the most relatable heroine I've come across in a book series. Cassie is teenage me and I'd be willing to guess you would see some of yourself in her as well. My second reason for enjoying this series is its setting. As I said above, this series takes place in the midst of an alien invasion. I'm sure this isn't true of all YA or Urban Fantasy books. But, the ones that I've read either take place in a reality different from our own, for example, one in which vampires exist. Or, they take place in a post-apocalyptic world. Some are both a different reality and post-apocalypse. But, in the The 5th Wave books are the only books I've come across where the apocalypse is still going on during the series. The Fever series is the only other one like this that I can think of. Like, I said, I'm sure there are others, but this and Fever are the only ones I've read. So, this aspect of the story was a major draw for me. It was so interesting to see how drastically things changed from one day to the next, in this world. How quickly the old world was forgotten. How quickly the dead were forgotten. It makes me curious to know what would actually happen if something like this, or another plague, or some other apocryphal event were to take place. Not that I WANT that to happen, but I am curious to know how the world would react. This book made me even more curious. give too much away. So, I'll just say that one of them is mostly due to Cassie's snarky personality and her boyfriend, Evan's need to be a martyr. The others I won't mention, suffice it to say there are some issues dealt with here that aren't usually discussed in YA books. I was very glad to see them, especially in this apocalyptic world. It kept a little bit of normalcy amidst the chaos. Cassie's schoolgirl crush is also talked about and featured heavily in this series. He is actually one of our narrators. He and Cassie's relationship is a source of endless amusement, for me at least. a book about aliens before. That was one of the most intriguing things about this series for me. I've read tons of vampire, Fae, werewolf, shapshifter, witches, and other supernatural books, but never one about aliens. Mr. Yancey paints a very interesting picture of the alien invaders. And, he also gives the reader a lot to think about in regards to the aliens. It was a very interesting portrayal and made for some great twists and surprises within the series. Aliens was also a nice change from the supernatural creatures that I'm used to reading in my YA and/or UF novels. I'd like to see if there are other alien novels or series out there to compare them to this series. I would also like to read more of Mr. Yancey's books since I enjoyed this series so much. That's all I've got to say about this lovely little series, dear Readers. I hope I've convinced you to give it a chance. If you've already read it, I'd love to know your thoughts below! PS: In my opinion, skip the movie. It was poorly done and bears only a vague resemblance to the book.